In honor of what have been Elvis Presley’s birthday, I’m going to step out of order here for a post and offer up a few clips of the Beatles covering the King of Rock & Roll during the Get Back sessions. This isn’t exhaustive, but hits a lot of the highlights. From the Anthology, the Beatles discuss meeting Presley in 1965. Jan. 8 also marks David Bowie’s birthday. 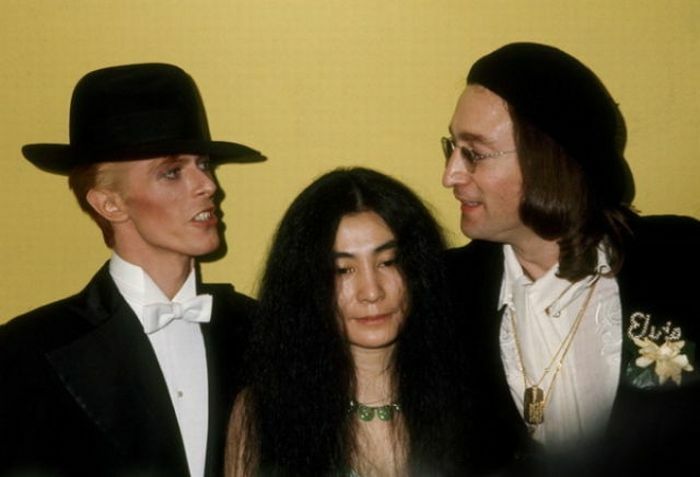 While the Beatles never played anything by Bowie, John Lennon of course worked with him in writing and performing on “Fame.” The same album, 1975’s Young Americans, also yielded Bowie’s cover of “Across the Universe,” which featured Lennon on guitar and backup vocals. Great post. That Anthology excerpt may be my favorite– so much was going on in it. I believe it’s the first time in the series that 1994-era Paul/George/Ringo show up together in the same place, which was amazingly jarring (if pleasantly). George steals the show with “Ringo played football with Elvis” but it also is the first moment I remember realizing John was an unreliable narrator and by analogy the others may be as well (I’m now convinced Paul spins everything). Having said that, the guy in the Bowie clip who implicitly suggests Iggy Pop has John Lennon’s stature needs to have his head examined. Thank you .. and I thought the SAME thing when I heard the Bowie clip. My first thought was “Jagger, Mercury”… and he goes with Pop. Not saying “Dancing in the Streets” is to be celebrated, but you get my point. I recently had a letter printed in The Guardian newspaper in Britain about the meeting of Elvis and The Beatles. The debate still goes on about what happened. The exhibition in Liverpool called Elvis and Us has a big exhibit on the meeting but the videos by the journalists give lots of false information. The account by Guralnick in Careless Love is as accurate as it gets. Howard, thanks for the info and the tip on the book!